When we were in New York City for our senior class trip, Celine and I split a piece of red velvet cheesecake at lunch. It was pretty much the best thing ever because it had a layer of red velvet cake, a layer of cheesecake, cream cheese frosting, another layer of red velvet cake, and more cream cheese frosting. Ever since then, Celine and I have had a craving to bake one of our own. Luckily, when we asked our wonderful grandfather for what he wanted as his celebratory dessert on his birthday last weekend, he asked for cheesecake. I never knew that he was a cheesecake fan, but since that’s what he asked for, we decided to give it a go! We had never made a classic New York cheesecake before, but we had heard rave reviews of this recipe, and it definitely lived up to expectations! It was creamy and full of tangy flavor (thanks to a substantial amount of cream cheese and a bit of lemon juice). Oh, it also had a thick graham cracker crust with just the right texture. I think it was the perfect cheesecake. You can tell by the picture that ours got a little bit too brown (we definitely overbaked it), but its taste and texture did not seem to have suffered a bit from it. This dessert was simple to make as well. When served with some homemade strawberry sauce, this was a dangerous dessert. Place an oven rack to the lower-middle position and heat the oven to 325 degrees F. Brush the bottom and sides of a 9-inch springform pan with 1/2 tablespoon of the melted butter. In a medium bowl combine the graham cracker crumbs, 5 tablespoons of melted butter, and sugar. Stir with a fork until the mixture is evenly combined and all the crumbs are moistened. Transfer the crumbs to the prepared springform pan and use the bottom of a ramekin or a cup to firmly press the crumbs evenly into the pan bottom. Bake until fragrant and just barely beginning to brown around the edges, about 13 minutes. Let cool on a wire rack while you make the filling. Increase the oven temperature to 500 degrees F. In the bowl of a stand mixer fitted with the paddle attachment, beat the cream cheese at medium-low speed to soften it slightly, about 1 minute. Scrape the beater and the bottom and sides of the bowl well with a rubber spatula; add the salt and about half of the sugar and beat at medium-low speed until combined, about 1 minute. Scrape the bowl again and beat in the remaining sugar until combined, about 1 minute. Scrape the bowl; add the sour cream, lemon juice, and vanilla. Beat on low speed until combined, about 1 minute. Scrape the bowl; add the egg yolks and beat at medium-low speed until completely combined, about 1 minute. Scrape the bowl; add the remaining eggs 2 at a time, beating until thoroughly combined, about 1 minute after each egg addition, scraping the bowl between additions. Using a pastry brush, brush the sides of the springform pan with the remaining 1/2 tablespoon melted butter. Set the pan on a rimmed baking sheet in case the pan leaks during baking. Pour the filling into the cooled crust and bake for 10 minutes. Without opening the oven door, reduce the oven temperature to 200 degrees and continue to bake until the cheesecake reads about 150 degrees on an instant-read thermometer inserted in the center, about 1 1/2 hours (note: we would check it at an hour, just in case your oven runs hot. Ours was done in a little over an hour). Transfer the cake to a wire rack and cool until barely warm, 2 1/2 to 3 hours. Run a paring knife around the side of the springform pan to separate the cheesecake from the pan. Wrap tightly in plastic wrap and refrigerate until cold, at least 3 hours. Once thoroughly chilled, you can run a thin spatula under the cheesecake to separate from the bottom of the pan. Carefully slide it onto your serving dish. In a medium saucepan, combine 1/3 cup water, strawberries, and sugar. Heat the mixture over medium high heat until it boils. Give it a stir and reduce the heat to medium. In a small bowl, combine the cornstarch with the 2 tablespoons of water and whisk until smooth. Pour this into the strawberry mixture and cook over medium heat for three or four more minutes, or until the sauce is thick and syrupy. Remove the saucepan from the heat and stir in the vanilla. Let cool. 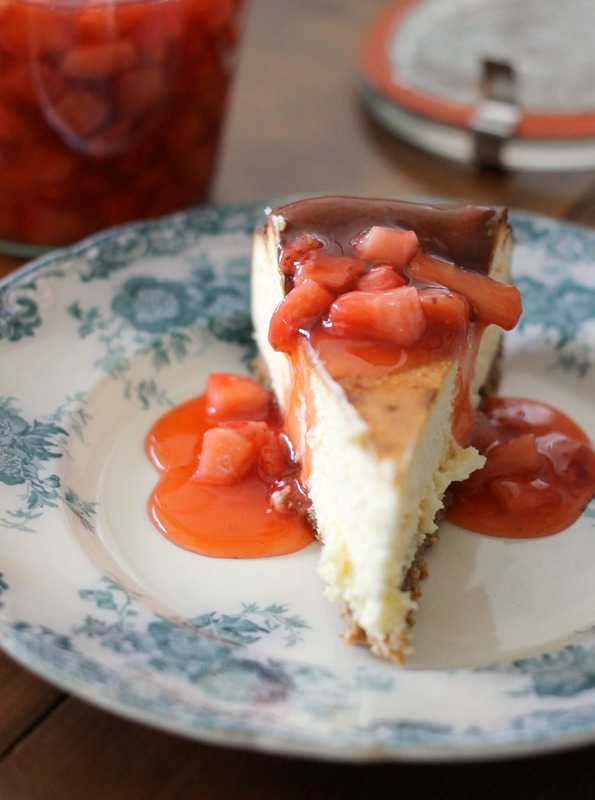 Slice the cheesecake and serve with some of the fresh strawberry sauce. Enjoy!